Dress up your Evo interior and keep yourself safe and secure with our selection of interior dress up parts. Racing Seats by Sparco dramatically increase the look of your interior, are comfortable to sit in and keep your body from sliding around like the stock Evo seats. We also carry shift knobs and steering wheels by Greddy and Sparco. 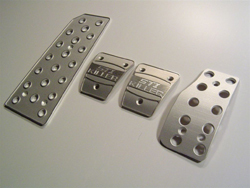 Our pedals are made from T304 Aluminum. We have them CNC milled and Engraved with the STi Killer Logo. These are a great piece for anyone who is looking to dress up their Evo or to just piss off your STi driving Buddies.